I haven’t heard anyone around me suffering diabetes yet, but it’s true diabetes and obesity are now recognised as major health problems in Japan too. Thanks for the informative post! 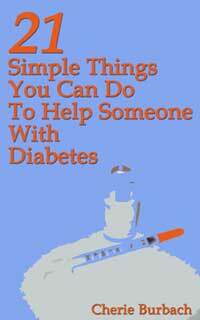 This sounds like a great read especially for those of us with diabetics in the family (and who doesn't nowadays). Thanks for sharing! Rebecca, it sounds like a great read. I have to brother-in-laws with diabetes and I like to try to have healthy foods for them. I'll look into this book. interesting ........, my dad has diabetes which is controlled by medication rather than the shots. Good post! Our papers remind us now and again on overeating sugar - people tend to ask for more and more in their foods. That's a problem indeed! I'm WAY late in responding to a post you left on my website (theprofessionalpalate.com)... my sincere apologies. Somehow my comments' notification was turned off. Anyway, thanks for the kind feedback. Kudzu Studios in Birmingham, AL did the design. My father in law has diabetes. This is a very nice post. Thank you. Great review. Fantastic information. My Brother is an insulin diabetic, I will be passing this post along. See...I really do Love Your Blog! Cheers! I will forward this to my friend whos son was diagnosed with diabetes 18 months ago at age 13, she will really appreciate it. Thank you soooooo much! This makes me think of that rock start- Bret Michaels who has not taken good care of himself and now his daughter may have this disease...eating all the right things and having to watch blood sugars is I'm sure a tough job for all involved...I will have to look for this book! Sounds like a great book-it's so important for family and friends to understand what a person with diabtes goes through and how they can help them(rather than tempt them)!! This is great and really really useful!! Wow that is really interesting. I know a number of people who have diabetes so I will have to check this out. Thanks so much, Rebecca! I can't wait to receive the tea! I emailed you my address. Luckily nobody in my family has ever had diabetes and let's hope it stays that way! But I found it a really informative post! So sweet of you to point out those book! Thanks so much for the book recommendation. My husband is diabetic and I'm still learning.